Lotus PLC as a company, has been owned by many other companies. It is currently owned by Proton, a Malaysian company. There are rumors that VW is interested in buying Proton. A new section has started to document current changes and, time permitting, document the past history of Lotus as it relates to the Elise. Lotus has flourished and suffered through a series of management changes. Some of the managers are listed, along with some of their accomplishments. There have been many changes during the life of the Elise and many are responsible for both the promotion and the delay of the Federal Elise. 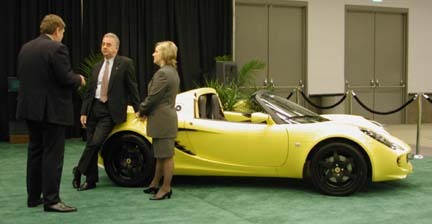 Many engineers have worked on the Elise, both at the beginning and for follow on efforts like the Federal Elise. See also below. Proud owners supply both their thoughts and pictures of the Series 1 cars. 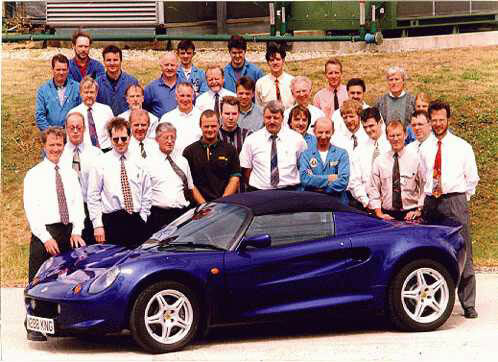 Alastair Florance, Press Officer, Barney Hatt, Stylist of federal interior, John Woods, Paint Shop Manager, Steve Crijns, stylist of series 2 exterior, Russel Carr, head of styling, Richard Rackham, originator of the Elise chassis concept, Tony Shute, original Elise project manager, now head of Lotus product, Mark Riches, Engineer, Andy Pirret, Manager of Lotus Fabrication division, Kevin Tingey, Elise production Line Manager, Luke Bennet, Manufacturing manager. Roger Becker and Nick Adams were away when the picture was taken. Thanks to Alan for asking Nick about names for the people in the picture. This team created the wonderful Elise. The talented engineering staff at Lotus used past company efforts and some original Chapman concepts to design and build the new car. From the reviews, it looks like they created a new car, inspired, beyond any that exist today. Thanks to Sue and her helpers, we seem to have identified them all. Thanks to Patrick Peal, Alan Burrows, Bob Anderson and others for the identification.